Portulacaria armiana is a large succulent-leafed shrub bearing grey-green leaves and long perennial whipstick-like branches with sprays of soft white flowers. It is endemic to the lower Orange River Valley, growing in the Ai-Ais-Richtersveld Transfrontier National Park. A very hardy, drought-tolerant plant best grown in desert and succulent karoo gardens. Perennial evergreen ascending spreading shrub to 700 mm tall (without inflorescence) and 1-1,5 m wide. It has fibrous roots. The branches can grow up to 35 mm in diameter, the older branches with yellow-brown bark peeling in horizontal, tough, slightly translucent strips. The young branches are softly succulent, grey-green, 9-12 mm in diameter. The internodes are about 10-30 mm apart. Leaves are fleshy, in opposite pairs, grey-green, obovate to egg-shaped (ovate), 30-70 mm long and 30-55 mm broad, the base of the leaf is wedge-shaped (cuneate), the tip rounded and the margin slightly wavy. The petiole is short, about 2-5 mm long. 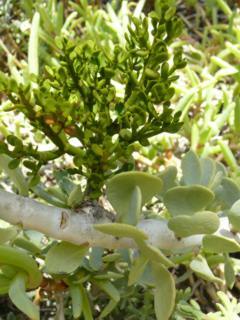 Portulacaria armiana is one of three Portulacaria species in South Africa, easily distinguished by its large cotyledon-like grey-green leaves and tall perennial whipstick-like inflorescence. The other species are P. pygmaeum, a dwarf species only a few cm high, growing on alluvial terraces in similar desert situations, as well as the well known spekboom or pork bush ( Portulacaria afra). The latter species is widely grown and widely distributed in the eastern parts of South Africa. It was treated by Andrew Hankey in the present series (Hankey 2002). Its distribution area falls within the boundaries of the Ai-Ais-Richtersveld Transfrontier National Park, and it is therefore well protected in its habitat. It was therefore not considered necessary to include it in the Red Data Book (Raimondo et al. 2009). 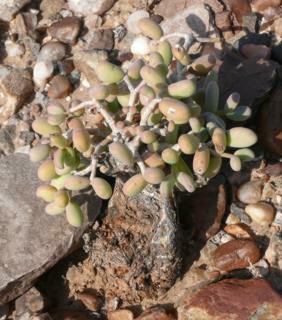 Portulacaria armiana is only known from granite outcrops not far from the Orange River, from Dreikopf in the east to the Dabimub River (both in Namibia) in the west. 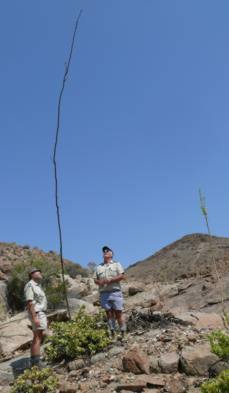 There is only one small site with a few plants in a very remote portion of the northern Richtersveld (RSA). P. armiana grows in regions below 800 m above sea level. It occurs in stands on various aspects always in full sun and conspicuous. Associated vegetation includes the boomvygie ( Stoeberia arborea ), giant quiver tree ( Aloe pillansii ), the gifkandelaar ( Euphorbia virosa ), gomnoors ( E. gummiphora ), Avas-kandelaar ( Euphorbia avasmontana ), wolftoon ( Ceraria namaquensis ), Commiphora capensis and Zygophyllum prismatocarpum. The granite-derived soils where it grows are usually slightly acidic. The climate varies from very hot to cool during periods of fog from the Atlantic Ocean. Rainfall ranging between 50-100 mm per annum occurs mainly during winter, but also sometimes during autumn with thunder showers. Portulacaria armiana was named in the Journal of South African Botany in 1984 by the author, honouring its discoverer, Mr Anthony R. Mitchell (the epithet `armiana' is derived from his initials A. R. and a portion of his surname) (Van Jaarsveld 1984a). Mr Mitchell (Presently from the Isle of Man) came to South Africa for a few years, based at the Karoo National Botanical Garden, from where he collected and studied species of Conophytum. He used a bicycle, travelling throughout Namaqualand and southern Namibia. He noticed the plants along the Boomrivier (on one of his journeys accessing the habitat from the Jan Haak Road on the north bank of the Orange River, S. Namibia), and brought them to the attention of the author. The author, together with Mr. Kobus Kritzinger, visited the spot, and this enabled him to name this species. 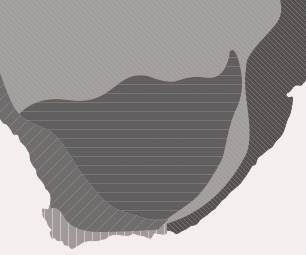 Mr. Kritzinger (Cape Nature) later also discovered a small population in the northern Richtersveld). Portulacaria armiana often grows in small dominant stands in vegetation classified as Noms Mountain Desert (Gariep Desert Bioregion) (Mucina et al . 2006). The tall perennial whipstick-like inflorescence (usually only three to eight produced by each plant) is remarkable and reminds one of the whipstick acacia ( Acacia robynsiana ) from the northern Namib. These inflorescences can be seen from great distances. The initial branch grows fast and is covered by leaf-like smaller bracts. These soon become deciduous, leaving a bare and smooth peduncle. The general length recorded is from 3-5 m. However, one plant had an inflorescence 8 m long! (Van Jaarsveld 1984b). One can only speculate on the strategy of the plant to protect its flowers. Producing flowers high up on its tall ascending branches not only protects them from the warm sun-baked earth, but also from dassie rats (Petromys typicus ), a local diurnal rodent with a characteristic fluffy tail. These vegetarian rats are widespread in the Namib Desert and Namaqua region. The delicate flowers would make a perfect meal for the animals, however the smooth and bare flowering stems of the Portulacaria inflorescence make climbing difficult and therefore keep the flowers out of reach of rats, dassies ( Procavia capensis ) and other smaller rodents as well as antelope. The other advantage of carrying its seed so high would be its seed dispersal, which is probably by wind. The light seed would have an advantage being produced far above the plant canopy which makes wind dispersal more effective. This plant and its dispersal strategy would make a fascinating study for a student of ecology. 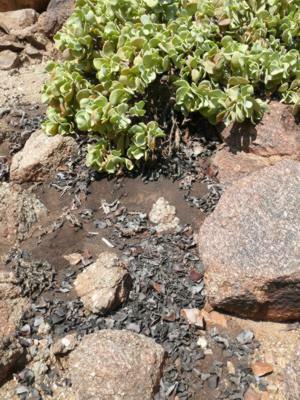 With our last visit to the Richtersveld (October 2012) black organic leaf debris was noticed below every plant which suggests (like in the case of its relative, Portulacaria afra ) that this debris is effective in trapping carbon . Uses and cultural aspectsThe region is traditionally occupied by Nama people (Khoi), and also by San who probably made use of the plant; however, no information was recorded. Portulacaria armiana thrives in cultivation, but is best grown in hot dry desert gardens (see Van Jaarsveld 2010). 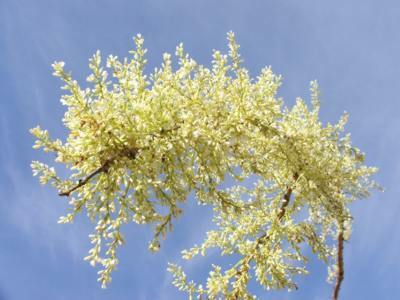 It makes a useful, attractive and interesting shrub with its grey-green large leaves and peculiar whipstick-like inflorescence. It grows slowly to medium fast (under ideal conditions) and should thrive in desert gardens all over the world. The plant requires full sun, and slightly acidic, well drained soil. Plants should reach flowering size within 3-4 years. The spekboom mistletoe (Viscum crassulae ) is a hemiparasite on the spekboom (Portulacaria afra ) in the Eastern Cape. It has been grown by the author on the spekboom for a number of years from seed introduced from the Kouga Dam region. The sticky seed of this green-leaved hemiparasite was also successfully attached to the whipstick spekboom (Portulacaria armiana) , and the two now grow in the Botanical Society Conservatory at Kirstenbosch. Portulacaria armiana is easily propagated from tip cuttings. It is best to take cuttings during spring. They root best in sand. A tip cutting with at least 2-4 leaves should root within 3 weeks. The plantlets can be transferred directly to small containers. Seeds have not been observed yet but it would probably be best to sow them in standard seed trays during summer. Plants react well to organic feeding (compost or any other liquid fertilizer). P. armiana is best sparingly watered throughout the year. Mucina, L. & Rutherford, M.C. (eds) 2006. The vegetation of South Africa, Lesotho and Swaziland. Strelitzia 19. South African National Biodiversity Institute, Pretoria. Raimondo, D., Von Staden, L., Foden, W.,Victor, J.E., Helme, N.A., Turner, R.C., Kamundi, D.A. & Manyama, P.A. (eds) 2009. Red List of South African plants 2009. Strelitzia 25. South African National Biodiversity Institute, Pretoria. arge-leafed Spekboom Portulacaria armiana , a new succulent from the Southern Namib. Aloe 21 & 20, 3 & 4: 63-66. Van Jaarsveld, E.J. 1984b. Portulacaria armiana : A new Portulacaria (Portulacaceae) from the southern Namib. Journal of South African Botany 50 (3): 393-399. Van Jaarsveld, E.J. 2010. Waterwise gardening in South Africa and Namibia . Struik, Cape Town.